The excitement, if not the goose bumps, has various dimensions; most prominently, a split in the ruling African National Congress, which gave birth to a relatively serious challenge to the ANC’s parliamentary dominance. An upstart group calling itself the Congress of the People (COPE), led by disaffected ANC members, is running a serious opposition campaign, and the fact that almost 30 percent of the 23 million voters are what are called “born frees”—people who were born after the end of apartheid and whose view of the country’s realities may be different from the generation that lived through the brutal years of repressive white minority rule. I talked with young voters who told me “the past is the past,” and while they revere Mandela and the victorious struggle he and his “pioneers,” waged, their lives are so changed by that victory that they are now looking for different ways to realize the promise of democracy. Some of them are voting for COPE because, they say, it promises change. They want jobs when they graduate and a vibrant economy to sustain them. At the same time, another first-time voter told me that he is voting for the ANC because he would not be attending the formerly predominantly white University of the Witswatersrand, had it not been for it. It is now predominantly black and headed for the first time by a black man. Moreover, this first-time voter said his parents and the parents of a lot of his friends would lose their jobs working for the ANC if another party came to power. So, for whatever reason, they are turning out, and their ballots could make a difference in the outcome. By mid-morning, top government and party officials had voted in polling stations around the country, including caretaker president, Kgalema Motlanthe, leading presidential candidate Jacob Zuma, new party presidential challenger Mvume Dandala, former President Thabo Mbeki and a smiling Nelson Mandela, who was greeted by voters with “Viva Mandela!” Many other older voters took advantage of the opportunity to vote from home. No one made any party speeches, as most had spoken on the final day of campaigning on Sunday. The ruling ANC, which is expected to win anyway, got a big boost at its Sunday rally with the arrival of Nelson Mandela who later spoke to the crowd of tens of thousands via videotaped message. He endorsed the party he helped bring to power by serving 27 years in prison for fighting white minority rule. Mandela voted for the first time in his life at age 75, and then led the country as its president for five years. It was a poignant moment to see him once again placing his ballot in the box and to see dozens of journalists assembled to witness South Africa’s icon vote. It still feels as historic as when I was here in South Africa in 1994. I was here and watched him then, smiling then in almost the same way as today, with American observer Gay McDougall standing by his side at that historic moment. She was smiling broadly, too. The frail but still regal Mandela has not said anything about the Congress of the People. But the rationale that COPE has offered for splitting with the ANC is that the party had strayed from the values of Mandela and the movement he led. Some protesters in Alexandra township near Johannesburg were outside their polling stations saying they saw no point in voting, since voting had done nothing for them so far. They are still waiting, especially for houses, promised when the ANC came to power 15 years ago. They say the process of allocating houses has been abused for years, so, no house, no vote. Preliminary results are expected today, with an official announcement on Saturday. The big question is: Will the new voters and the new and old opposition be able to stop the ANC’s from maintaining its two-thirds majority in the parliament, which gives it the power to govern virtually unopposed, even if it wanted to change the constitution. 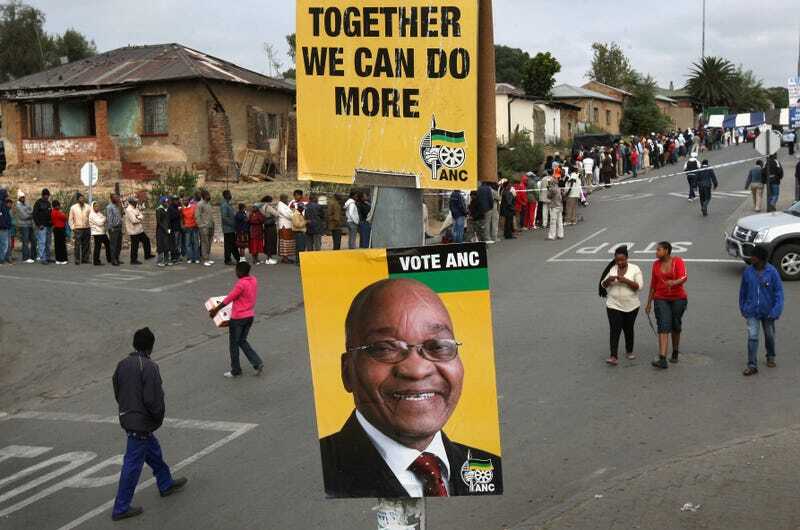 The ANC has argued that it has had a two-thirds majority for the past five years and has not abused its power. Still, many argue that a strong democracy needs a strong opposition, which doesn’t exist at the moment. So, as I have often said about this watershed and often unpredictable moment in South African politics—stay tuned. Charlayne Hunter-Gault is a Johannesburg-based journalist and author of New News Out of Africa: Uncovering the African Renaissance.